It was a cold, wet morning in February of 1997, when I walked into a 3,000-square-foot Northridge warehouse that was sandwiched between Al’s Auto Body and a stretch of doughnut shops and nail parlors. Bundled up to ward off the rains that were then pounding Southern California, Jacques Heim and his 11-member Diavolo Dance Theater were running riot with 10 doors that had just been delivered. 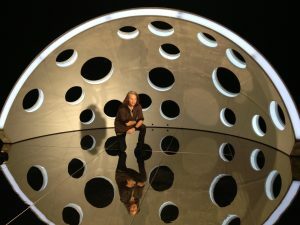 It is testament to Heim’s unflagging commitment, blazing creativity and continued passion for the art form that this bold statement has come to pass: Not only has the troupe, now rebranded as DIAVOLO | Architecture in Motion™, sustained a 25-year career based in Los Angeles, it is also emblematic of the city itself: brash, forward-thinking and, yes, easy to love. Under Heim’s stewardship, the company takes audiences on multi-layered journeys – emotional, visceral and psychological. And whether commenting on romance and the human condition, the cosmos or the put-upon worker, Diavolo has, through the years, continued to evolve artistically, at the same time touching hearts. Witnessing this growth, one wherein the company is in its 18th year of international touring and at home continues to give back to the city in various ways, including through MCOT, the Music Center on Tour educational program (schlepping the troupe’s huge structures to hundreds of L.A. schools is no easy feat), and by offering other free performances, such as the troupe’s site-specific concert at the 2012 opening of Grand Park, has been nothing short of sublime. 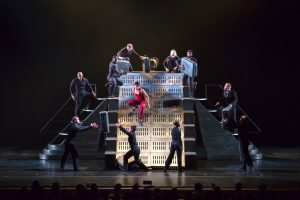 And wherever I catch a Diavolo performance, from Jackson Hole, Wyoming and Wolfsburg, Germany to Valley Performing Arts Center (VPAC), I’ve seen audiences swoon, marvel, smile and connect – with the artists onstage and with each other. Diavolo, is, after all, about trust. It’s also about the human spirit and the troupe’s standing in the cultural life of a city proud to call them its own. 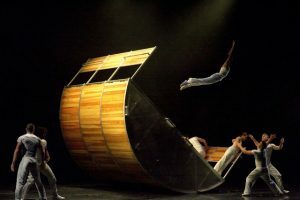 With signature outsized structures that include a massive aluminum cube (Foreign Bodies), a quirky spaceship-like dome (Fluid Infinities), and an enormous rocking boat (Trajectoire, performed at the anniversary concert), Diavolo has had a profound impact on dance in L.A., and what it means to live, breathe and be willing to risk everything for a form that is often underrated, if also misunderstood. As for Heim, 53, process is as paramount as performance. With the troupe’s move to its 6,000-square-foot studio in the Brewery Arts Complex in August, 2002, Heim’s works also began to assume more epic proportions, and where attending a Diavolo rehearsal is akin to taking a master class in creativity. I often watched as Heim’s seed of an idea – first sketching the structure he wants before collaborating with architects, sculptors and production designers – morphed into a work’s theme. Some six months later, Heim, who also does research and ideates scenes with a 3-D model, gives homework to his dancers that then initiate movement around a theme, the universe, for example. This intense preparation results in Heim knowing, on the first day of rehearsal, how the piece will begin and end, with thousands of hours in between, when the work is finessed, tweaked and worked out with split-second timing, the entire process from conception to performance two years. This work ethic proved propitious in 2002, when Heim was asked to choreograph Cirque du Soleil‘s permanent Las Vegas show, KÀ, which opened in 2004. The extreme pressure coupled with a huge budget pushed Heim to greater artistic heights. Indeed, it was this experience that prepared the Frenchman to work with the Los Angeles Philharmonic, who, in 2005, commissioned a trilogy that premiered at the Hollywood Bowl in 2007, 2010 and 2013, to music of Esa-Pekka Salonen, John Adams and Philip Glass, respectively. That monumental, three-part opus, collectively called L’Espace du Temps, and which the L.A. Times first described in 2007 as, “one of those rare events that defines the art of this city,” premiered in its entirety at VPAC in 2015, courtesy of VPAC executive director Thor Steingraber, further embedding Diavolo into the artistic fabric of Los Angeles and catapulting the troupe to new levels of virtuosity. Today, Heim’s work goes even deeper: Diavolo executive director Jennifer Cheng, who joined the organization in 2103, wished to expand the troupe’s community outreach, suggesting Heim work with war veterans. Embracing that notion last year, he conducted a series of workshops that culminated in a December performance, with Diavolo member Dusty Alvarado serving as project director. 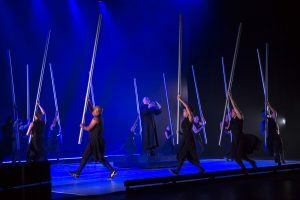 The latest iteration, Veterans’ Project, Phase 2, features 15 veterans and a pair of Diavolo dancers performing on Daniel Wheeler’s 6-foot x 6-foot platform that sits 18 inches off the ground, a space Heim considers sacred. And we can thank Heim and Diavolo, aesthetic warriors enhancing our lives with their art, for keeping a company together for 25 years, an odyssey that is far from over. Photos of Passengers and The Veterans Project: Phase 2: A Long Journey Home by Luis Luque. Photos of Fearful Symmetries by Thomas Ammerpohl. 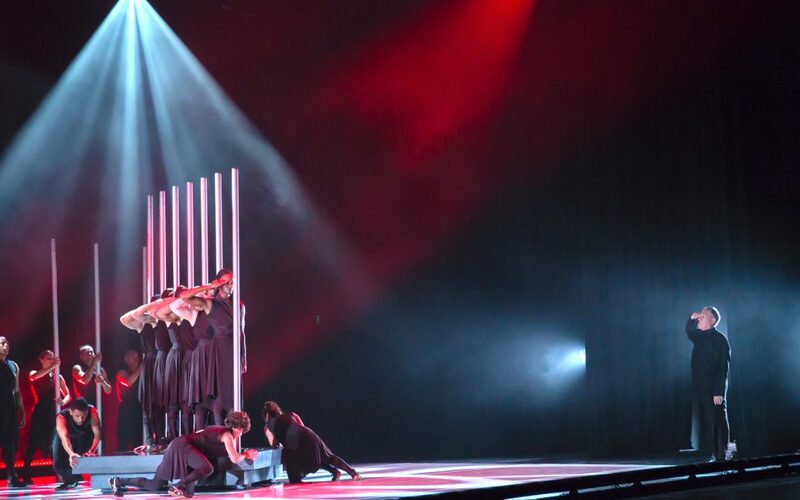 Photos of Fluid Infinities and Trajectoire courtesy of Diavolo.